Distinctive features: The first calculator in a ball-point pen. 160 mm x 15 mm (6.3" x 0.6"). Cost: The initial cost was US$79.95 [about £45 GBP], but this fell to US$19.95 [about £11 GBP]. The buttons are 4-way switches. To operate, a finger is placed on a button and moved sideways in the direction of the number or operation required. The journal Popular Science concluded "While the four-in-one design is a clever idea, actual performance is awkward—so is writing with the thick pen". 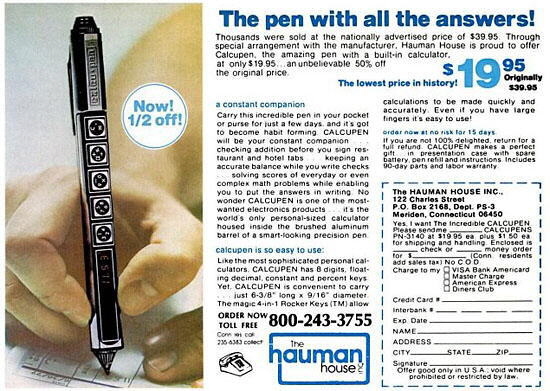 Advertisement for the Calcu-pen from November 1977, with heavily discounted price. Click here to see the article "Unusual Calculators The Calcu-pen" by Guy Ball in the "Collecting Calculators" section of this site. 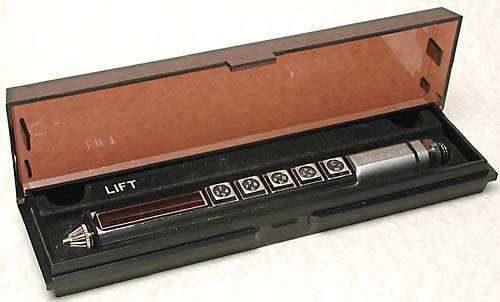 By 1975 the electronics required for a calculator had shrunk so much that it could be fitted into a, slightly bulbous, ball-point pen. "Novelty Calculators", Popular Science, January 1977, p59.